Hublot for The Rake Aerofusion Chronograph ‘Molon Labe' - available now only on The Rake. As far as military leaders go, there is none more capable of reaching through the fabric of time to constantly inspire us than the Spartan King Leonidas. In 480 BC he marched with his 300 Spartans to the “Hot Gates” of Thermopylae, and repelled a Persian invasion of two million men, slaying his foes by the thousands before he and his men were killed to the last, but in so doing rallying all of Greece together to repel their invaders. It is implied that Leonidas’s exceptional performance in the Agoge made him the choice for king when his elder brother was eventually deposed for insanity. The legend goes that upon being named the leader of the city-state, someone said to him, “Except for being king you are not superior to us.” To which he retorted, “But were I not better than you I should not be king,” referring to his prowess as a military leader. Braggadocio aside, Leonidas proved his worth and ascended to the status of eternal legend, during the second Persian invasion of Greece. It was a time when Sparta had a lot to make up for. During the first invasion of Greece by Darius I in 490 BC, the Athenians had sent a messenger to run the 140 miles to Sparta to beseech them for help. He was denied on the grounds that they were amidst a religious ceremony. The Athenians went on to victory and were glorified by all of Greece. Leonidas was not going to let that happen. Supposedly, before departing on what was clearly a suicide mission, his wife Gorgo told him, “Come back with your shield or on it,” which as far as badass things a wife can say to a husband before he leaves to face certain death, has got to rank at No.1. To be exact, Leonidas’ force numbered 300 Spartans, 900 Hoplites (slaves subjugated by the Spartans) and several other allied Greek forces. It is believed the actual number of men he commanded was around 7,000. Which still pales in comparison to the close to two million commanded by Xerxes (historians feel this might be closer to 300,000). Nonetheless, when commanded by Xerxes to lay down his weapons and bow to his might, it is Leonidas’ retort, “Molon Labe” or “Come and take them!” that echoes in eternity. Leonidas and his Spartans repelled unending waves of frontal attacks to the point the tens of thousands of bodies of his vanquished enemies were said to have been piled high into a wall. It was only on the seventh day that the enemy was able to flank him, thanks to a Greek traitor named Ephialtes whose name shall live in infamy forever. Knowing that the end was near, Leonidas commanded all remaining Greeks, save his Spartans, to retreat. And then along with his men he fought to the very last man. Even though he had been killed, the Spartans repelled the enemy four times to retrieve his body. When word of the battle of Thermopylae spread, the tale of Spartan courage in the face of innumerable odds rallied all of Greece together to repel Xerxes and Persia once and for all. In 1955, a bronze statue of Leonidas was erected at Thermopylae and under it the words “Molon Labe,” are inscribed. And so it began with the concept of ancient and contemporary universes colliding within the fiery crucible and fierce geometry of a single watch. After all, wasn’t this the calling card of Hublot? Isn’t “fusion” – the concept of modernity and tradition, the best of material innovation intrinsically, intermarried with the 200-year-old traditions of high Swiss watchmaking? The first thing to achieve was to quickly arrive at the idea of metals each embodying the past and the future. 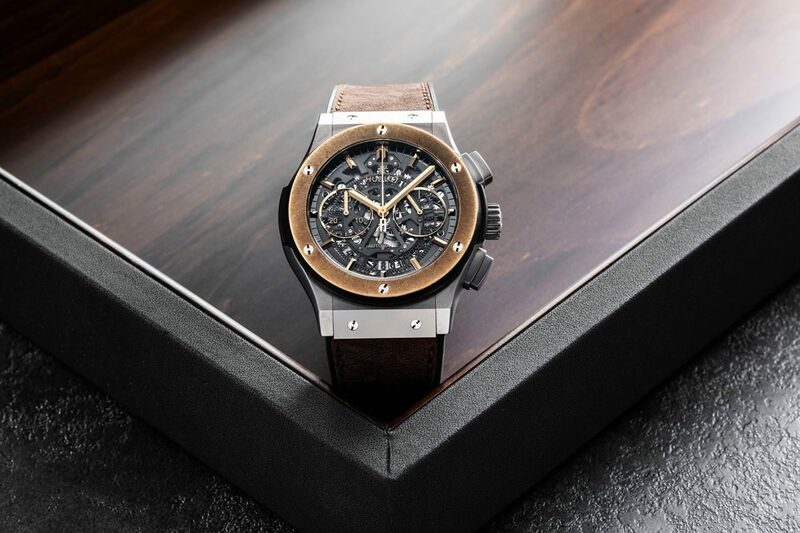 And so the materials selected for The Rake’s very first collaboration with Hublot are first an expression of contemporary technical advancement and second ­– and perhaps more evocatively – an embodiment of the two most legendary warrior cultures of the ancient world. And their names bristle and resonate with a sense of purpose born out of their extensive use in combat. Anyone with a penchant for handmade bicycles is going to be familiar with the name titanium. Even in the age of carbon fibre, titanium is still the material of choice for the most coveted and beautiful frames from the world’s most artisanal builders. It is, simply speaking, the metal that boasts the highest strength-to-weight ratio. It has a near infinite fatigue life, meaning that it can steadily absorb shock indefinitely, with almost no change to its molecular structure and is totally impervious to corrosion. It is hypoallergenic, which makes it the substance of choice for medical implants. And it is self-healing in that when scratched, a protective oxide layer instantly and spontaneously reforms. This extraordinary material was discovered in Great Britain at the turn of the 19th century and was named for the Titans of Greek mythology. But it is the US Air Force that is most commonly associated with the use of titanium. During the 20th century, titanium’s superhuman performance qualities were exploited by the aerospace and military industries. Titanium is so damnably strong and crazily resistant that it was used extensively in the US Air Force’s spy jet SR-71 Blackbird that for over 30 years held the record as the fastest plane ever created. At its top speed of 3,500 kilometres an hour, most metals would simply melt and disintegrate because of the heat generated by aerodynamic resistance. But not titanium! The Blackbird was so fast that standard operational procedure when a surface-to-air missile was fired at it was simply to outrun it. The Blackbird could only be produced by fabricating its skin and structure largely from titanium. Similarly, at the height of its renown between 4 and 6 century BC, the Spartan army was considered so superior to any other in the world that one Spartan soldier was considered more valuable than a multitude of men from any other nation. And it was bronze that gave this army its technical advantage. The material used to furnish the armour and weapons of the most legendary warrior culture of all time. Sparta differed from all other nations in that every male citizen was a full-time soldier first, and a farmer, poet or ruler second. The prevailing regime was so harsh that babies considered too weak to serve the state in military duty were left at Mount Taygetus to die. Hoplites as the infantrymen were said to begin training at the Agoge from the age of seven. They had to demonstrate unwavering courage, adaptive intellect and full physical prowess for a full 23 years after that before they could be granted citizenship at the age of 30. The key to Spartan military might was their unwavering phalanx, a wall of overlapping shields held by men standing shoulder-to-shoulder, each row of men supported by the row behind. The drill to ensure the phalanx never broke down was immortalized in the novel Gates of Fire by Steven Pressfield, detailing the saga of the 300 Spartans at Thermopylae. Colloquially referred to as “tree f**king”, it involved row after row of men pushing against a massive tree and could last for days. It was so arduous that men would routinely die from exhaustion. A Spartan could lose his helmet or breastplate but losing his shield meant shame or death as your armour was used for personal protection but a warrior’s shield protected the man next to him. Shields or Aspis were constructed of a wood core with an outer layer of impenetrable bronze marked with a Lambda symbol for “Laconia” or “Sparta” in ancient Greek. The sight of these glowing bronze shields held one over the other across the battlefield must have been truly terrifying. Bronze was also used for the Spartan helmet with signature eye slits, his breastplate and greaves. So it was that the idea was to unite these two mythical materials within the architecture of a Classic Fusion Hublot model. And I already knew which model I would like to form the geometric blueprint of the watch in question. 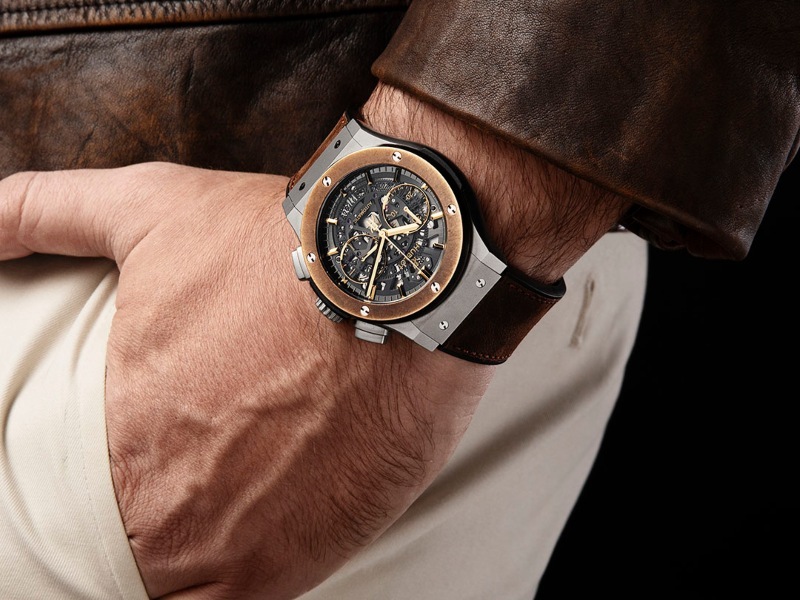 Introduced in 2013, the Hublot Classic Fusion Aero Chronograph has long been my favourite reference made by the brand. It takes all of the slimmer, more elegant Classic Fusion case styling and dimensions and adds a level of engaging transparency and arousing visual dynamism with a sapphire crystal and a highly skeletonized in-house chronograph movement. The initial renderings for the watch came back and I was immediately enamoured with the result. And while Hublot has now made several watches using bronze – specifically an engraved bronze watch for their collaboration with the extraordinary cigar maker Arturo Fuentes in a time and date-only version, and another limited edition in Big Bang format in collaboration with Meindl, Bavaria’s most famous producer of lederhosen ­– however, this was an alloy using tin and burnished in a specific way. The combination of the two materials remained unique to The Rake. Further, I proposed the idea of sandblasting the titanium case to better evoke its pragmatic aerospace and military roots. The resulting tension between a classic styled case, with two metals from opposing time periods both rendered in refined yet brute finishes created a stirring dynamism. This is further enhanced by the strong interplay with the dark grey skeletonized baseplate of the movement, which occupies much of the dial-side real estate seen through the two layers of transparent sapphire. Applied to the transparent dial are indexes and subdial frames and minute markers, all rendered in bronze, as well as the sword-shaped hands and the sweeping chronograph hand, also in bronze theme. Amusingly, one of the longest processes related to the design of the watch focused on the strap. By this point, it was decided to base the project out of The Rake’s hometown of London. And so it was that Hublot’s very Rakish brand director for the UK and France Benoit Lecigne and I spent several hours trying to arrive at the perfect bracelet. We toyed with the idea of shark and then suede. 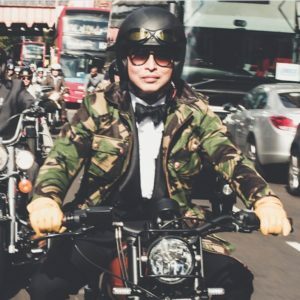 We even tried leathers that would evoke the horsehide used for our favourite motorcycle jackets. But it was finally at Basel this March at a fortuitous and spontaneous meeting between Ricardo, Benoit, myself and a man that I consider to be one of the greatest innovators in his traditional métier that we arrived at the answer. That man’s name is Carlito Fuente. Arturo Fuente is something of a legend in the cigar world. He left Cuba after the Spanish-American war in 1902. By 1912 he had founded his eponymous cigar brand with cigars rolled in Florida but using Cuban tobacco. He was of the opinion that while Cuba created the best tobacco leaves, the quality of production and the standards of quality control could be much improved upon. Following the Cuban embargo, Arturo’s son Carlos, soon to become an icon in his own right, travelled the world sampling leaves from Puerto Rico and Mexico. He finally arrived in Nicaragua and found the tobacco appealing enough to set up production there, only to have it burned to the ground following the revolution. In 1980 Carlos and his son Carlos Jr, or Carlito, restarted from the ground up in the Dominican Republic, this time with the lofty ambition of creating cigars that would rival the very best from Habana. It was a feat nothing short of the Californian winemakers defeating the French in the first international blind tasting. Fuente's soon to be fabled Opus X soon became as coveted as Cohiba or Trinidad cigars for their multi-layered palimpsest of flavours. Over cigars, Guadalupe, Lecigne and I all looked at the perfect shimmering oily wrappers of our beloved Opus X cigars and remarked that the straps should be an homage to Carlito’s near-alchemic abilities in blending to craft some of the most famous cigars in Christendom. To our delight, Fuente agreed to participate in our special watch project and will be present at the launch of the watch to offer a tasting of his mythical smokes. So it was that philosophy, warrior culture, sybaritism and passion all formed a heady fusion, that just as in the perfect blended cigar, yielded what I believe is a result that is far greater than the sum of its parts. But the watch was still somehow missing both a name and a last great detail. Inspired as I was by the story of Leonidas and his 300 Spartans I finally realized what it should be. Engraved in the titanium case back of each watch are the extraordinary words that formed his response to Xerxes when commanded to lay down his arms: “Molon Labe,” translated as "Come and take them,” which I feel will serve as a mantra of empowerment to any man that deigns to strap this watch to his wrist. The Hublot for The Rake Classic Fusion Aero Chronograph “Molon Labe” will be made in a limited edition of 25 watches launching September 2018 with a price of £14,900. To register your interest, email shop@therakemagazine.com.